The coconut tree's scientific name is Cocos nucifera, and it is commonly known as a coco palm or coconut palm. Coconut trees are hardy to grow in USDA cold-hardy zones 10B through 11, which provide the warm conditions needed for development. These trees grow to heights of 60 feet and with spreads up to 25 feet. 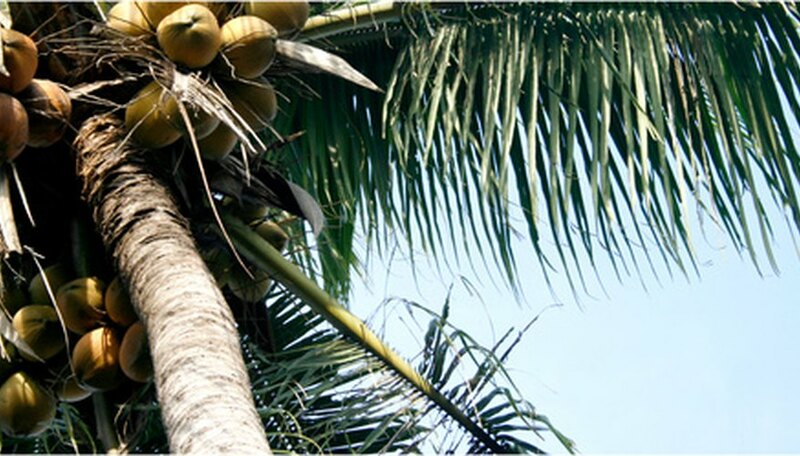 Coconut trees can produce 25 nuts or more annually, and they live for up to 80 years. Growing coconut trees requires a minimal amount of maintenance. Prepare a growing location that provides full sun and well-draining soil. The coconut tree does well in most soil conditions with pH levels ranging from 5.0 to 8.0. Space the coconuts trees 18 to 30 feet apart. The best time to plant a coconut tree is during the summer rainy season. Clear the area of all rocks, plants or other debris. Dig a hole the slightly deeper than the height of the container and double in width. The transplanted coconut trees root system should be planted 1 inch below ground level. Run the rake along the bottom and side of the hole to loosen the soil. Place the coconut tree in the hole. Backfill with soil around the root ball of the tree and gently pack the soil. Thoroughly water the transplanted coconut tree to remove any air pockets and compact the soil around the root ball. Add more soil if needed, after watering. Add a 3 to 4-inch layer of mulch around the base of the newly planted coconut tree. Stay clear of the trunk of the tree and extend it out at least 2 feet on all sides. This will keep weeds from growing around the tree and will hold the moisture in the soil. Supply 1 inch of water weekly to the coconut tree for the first year when rainfall is less. The tree is considered established after this time, but it will require watering during any long dry periods. Apply palm fertilizer four times a year around the canopy area of the coconut palm tree. Thoroughly water the tree after applying fertilizer to ensure it reaches below the soil.